Learning through play is digital now, with apps and games teaching everything from phonics to times tables and basic physics. If you’re planning to invest in a children’s tablet packed with educational potential, read our guide first – we asked two computer-savvy parents and six children to put some of the most popular through their paces. Just like adult tablets, the Kurio is a multimedia device with touch-screen technology. It can run any Android application for tablets or smartphones, but essential and popular apps like Google Chrome, YouTube Kids and Subway Surfers are preloaded on it, as well as Kurio's own-brand KD Interactive educational games. The Kurio also works as an eBook reader and music player and has a 3D graphic engine for games, plus front and rear cameras and a micro SD card slot so you can expand its capacity (or transfer video or music files onto it from another device). The 7-inch screen is splashproof and the device comes with a shockproof bumper (available in blue or pink); an anti-bluelight filter reduces the strain on kids' eyes. The parental control and web filtering system, Kurio Genius, is the best one we tested – simple to use for complete peace of mind. You can lock apps on certain days, set time limits (and have different limits set for weekdays and weekends) and control web access. Video tutorials are available to help you manage the system, but it's very intuitive and you're prompted to set it up as soon as you turn the device on for the first time. Being able to set up to eight different profiles, so everyone in the family can have appropriate content and online access. Switching between users, changing the screen theme and customising avatars is very easy, too. The KD Interactive games were fun and beautifully designed; the kids found them engaging and didn't seem to realise they were doing maths! How adaptable the Kurio is. You could easily share it with your child and get lots of use out of it as an adult (whether they'd let you have a turn is debatable though!). The protective bumper is could be a little sturdier. Best for... a fantastic price for a great tablet which your child will be able to use for years (though they might have to hide it so you don’t ‘borrow’ it too often!). 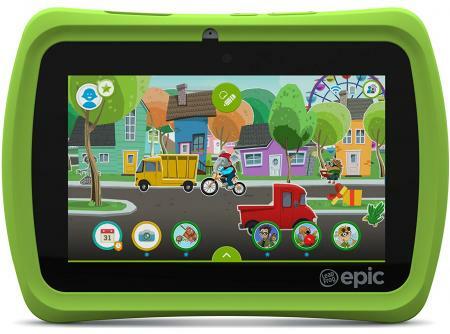 First and foremost a learning tablet, the Leapfrog Epic is a safe introduction to the world of apps and videos for children aged 3 to 7. The 7-inch screen is as large as the screens on all the other tablets we tested, but the device is protected by a rugged case that seems reassuringly solid and able to withstand some rough treatment! A good selection of games (more than 20) is preloaded onto the device, but thousands more are available online, allowing you to follow a step-by-step learning programme with your childand track your child's progresss in maths, literacy and problem solving. The web browser is locked down and only allows you to use LeapSearch – the perfect solution for younger kids, but not appropriate for anyone aged 9+ who's doing online searches to help them with homework. It can be played with straight out of the box – you won't even need to connect to wifi to get started. 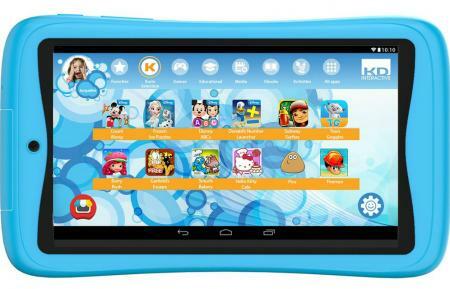 The interface is very easy for kids to use and the design is bright and appealing to young children. Very education-focused. There's even a "word of the day" app to help expand your child's vocabulary. It's simple to set limits on what apps can be used and for how long every day. Screen time management just got easier! The stylus, which can be used to interact with the screen, is attached to the tablet with a string – vital to stop it getting lost at the bottom of the toybox. A great choice for younger children, but it has a limited lifespan and children will definitely grow out of it by the beginning of KS2. The apps in the Leapfrog AppCentre cost about £7.50 each and can only be used on Leapfrog devices. Works best with a Leapfrog Academy subscription, which is £6.99 a month after the one-month free trial. The "voice" on the games is very, very American and may be a bit grating to British ears! Best for... younger children – the Epic looks and feels like a "grown-up" tablet but the very controlled online access means complete peace of mind for parents. Another Android-based device, the Kindle Fire is high-tech (7-inch screen, quad-core processor, front and rear cameras, micro SD slot for expandable storage and file transfer) for a very affordable price. It comes with a protective case (available in blue, pink or yellow) and a reassuring "no questions asked" two-year guarantee. The interface has been designed with kids in mind, so they find it easy to locate the book, app, game or video they're looking for, and you can add content to your child’s profile to give them access to specific items in your personal library (Netflix or Minecraft, for example) in Fire for Kids Unlimited. There's an amazing amount of content available for your child to explore, and you can make sure they only see what's suitable for their age group (so no "baby games" for your oh-so-grownup seven year old!). The Kindle will "grow" with your child, offering different educational and entertainment opportunities as they get older. It's a great investment buy and works just as well for a teenager (or an adult!) as it does for a child. For book lovers, the Kindle app turns the Fire into an e-reader – perfect for stocking up with books before a holiday. The two-year "worry-free guarantee" – if anything happens to the Fire (a cereal soaking or fall from the top of the stairs, say) you can return it and Amazon will replace it for free. The parental controls are web-based, so you'll have to set everything up before you give the device to your child, but you can set screen-time limits and manage the content and websites your child has access to. The Fire comes with one year's access to Fire for Kids Unlimited, an all-in-one subscription to a library of thousands of child-friendly books, videos, educational apps and games. After a year you'll have to pay a monthly subscription though, from £1.99 per month per child for Amazon Prime members (but up to £7.99 for four children if you're not a Prime member). Best for... the complete kids' tablet package! Brilliant value for money and particularly good if you are already signed up with Amazon Prime or use a Kindle yourself, as you'll be able to share conent you already own with your child. 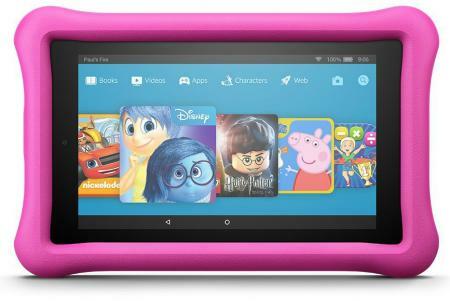 A learning tablet toy that's just for kids, the InnoTab Max is a great option for children aged 2 to 6. The 1.2 GHz processor and Android 4.2.2 operating system provide the computing pwer, and the 7-inch touch screen is easy to use and extremely child-friendly (even the youngest users will pick it up in minutes... after all, they've used your phone for years!). All the available educational software includes a recommended age range; choose from reading, maths, science and problem-solving content to introduce everything from handwriting to logical thinking. Recharging is easy, so no expensive batteries are needed, and your child will be able to play anywhere with no need for wifi. The blue detachable cover, which protects the tablet and also acts as a stand for it. The VTech Kid Connect lets your child send text and voice messages, animated stickers, drawings and photos to your smartphone so they can pretend to have a phone of their own. 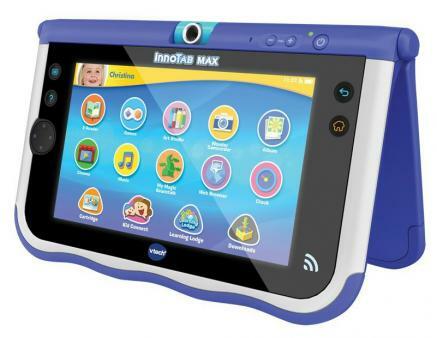 The InnoTab is more a toy than a tablet, and you'll need to buy Learning Cartridges (around £19.99 each) or pay to download content from the Vtech Learning Lodge to offer different games and experiences. Best for... offline learning for younger children who are desperate for a tablet of their own to be just like their older siblings or friends.